When I am not traveling for work, mornings find me walking my dog, Aboo. We hike up to Mount Tabor Park in Portland, OR, an amazing urban landscape of huge trees and quiet trails. Near one of the park entrances, a rock wall is being installed. The landscape crew, now about halfway through the project, is working at moving huge boulders, fitting them into their proper places. As I observed their work this morning, I admired the ways these “stone quilters” create structures that are both functional and beautiful. My admiration stems from an awe of their precision in placing these stones. They use guide lines and level lines to guide their efforts. But, because nature is unpredictable, there is no exact plan on which rock to place first, second, third and so on. 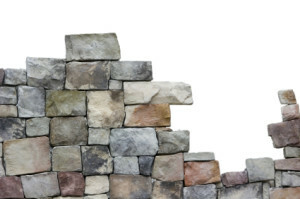 In order to make their beautiful walls they simply need to lay the first rock, review the space and then select the next one. They prepare as much as they can — piling similar-sized boulders together, for example — and then they begin. As they build, they tweak, move, and add smaller rocks to help create the wall they see in their mind’s eye. But a wall will not exist until they get started. Some advisors feel the same way about using social media, I imagine. It all seems complicated and overwhelming, so they opt to simply stand on the sidelines and let others go first. Sadly, these advisors miss out on important conversations, critical connections and an inexpensive way to build their market. No more excuses! What’s the first rock that you plan to lay to start your social media effort? How about something as simple as connecting with all of your clients and prospects on LinkedIn? You can look for LinkedIn Groups in your region or join your alma mater group. This could be the week that you set up a Twitter account, or the one when you begin to integrate LinkedIn into your sales and marketing efforts. Whatever it is, begin by beginning. Look up each one of your clients on Facebook, LinkedIn and Twitter. “Like” or follow their company pages. Do the same for your key partners or leaders in the financial services industry. Principal, Fidelity, American Century and others have Twitter profiles. You can learn quite a bit from their posts and discussions. Connect with other advisors outside your region. This increases your network and may provide a tipping point to your profile on LinkedIn. Once you have 250 connections, LinkedIn “spiders” can make more accurate recommendations on new connections. Before your next meeting, head to LinkedIn and review the profiles of the key decision makers. If you watch CNN or listen to NPR regularly, add them to your Twitter feed or Facebook friends list. Finally, set a timer for 15 minutes every day to explore social media. That way you won’t worry about the distraction, and you’ll have a definitive deadline for your efforts.